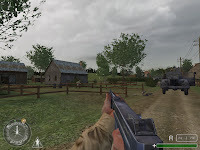 You en your squad are entering a Village of the French Ardennes close to the Belgium border Even if German are in full retreat, You still may encounter Resistance main objective are secure the village, get back important documents and finally call HQ for reinforcement. This one was for me back in 2004 the first correct release that came out for COD. 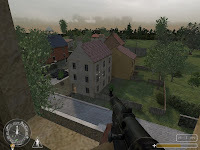 The author succeed in make an entire mission (with well design first 'paper' objective screen) that had everything needed from design to objective and well oirneted gameplay...He worked after for the BDT on one map called Oosterbeek for Operation Market Garden Add-on (for more info check author's website). Design is well handle in a quite well based village (Garry took reference from picture and photos) the entire architecture is very realistic on a realistic designed terrain, building are well mixed and except perhaps the school that looks too dark (especially regarding the amount of windows) all other house are well crafted and designed. Gameplay is mostly linear but well agremented by objective to be achive. Some ambush and surpise will certainly catch the attention from the player and even if attacks could have been more difficult it is a well balanced experience. In conclusion: a real decent release that can easily be considered as a must play experience where everything is nearly perfectly done. Looks like the download link isn't working. Any chance you could update it?